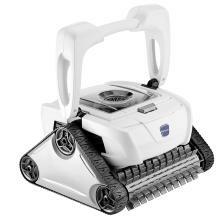 The Polaris P945 features a rear water cleaning stream which blows debris off stairs and out of tight corners. Its over-sized suction intake allows it to ingest larger debris effortlessly. With durable Aqua-Trac tires and Vortex Vacuum Technology, the P945 tackles any pool terrain and climbs over obstacles without getting stuck. It cleans all pool surface types and scrubs the floor, steps, walls, and tile line with a pleated scrubbing brush in as little as 1.5 hours. The P945 cleans pools up to 50' in length. It includes a new premium, compact transport caddy that can be assembled in just minutes without using any tools. This model is backed by a 2 year limited warranty. Easy Lift System - With the touch of a button the P945 surfaces to a desired location and waits for you to grab it, then automatically evacuates water for effortless removal from the pool. 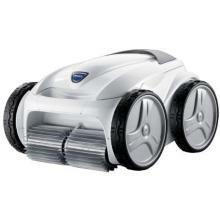 The P955 tackles any pool terrain, climbs steps and walls, and scrubs tile line with a solid-blade scrubbing brush. 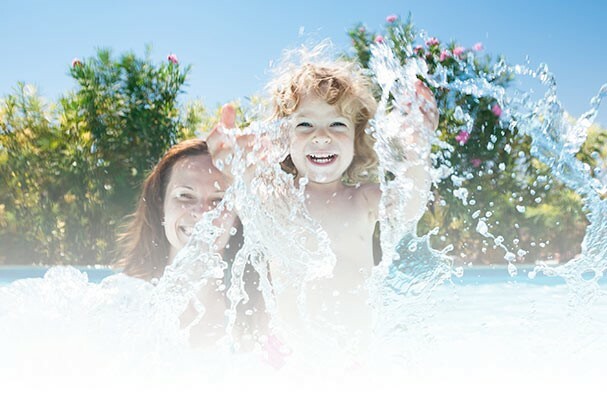 One of the distinct advantages of P955 is the smart 7-day programmable timer, with fully customizable cleaning cycles that allows pool owners to set it and forget it. With just a simple setting, you can clean the pool as frequently as you like and enjoy a pleasant, healthy pool all the time. In addition, the intuitive motion sensing remote puts the cleaning control in the palm of your hand. Just point and direct the P955 to any desired location in the pool and you will never miss a spot. The P955 cleans pools up to 60' in length. It includes a new premium, compact transport caddy that can be assembled in just minutes without using any tools. This model is backed by a 2 year limited warranty. Easy Lift System - With the touch of a button the P955 surfaces to a desired location and waits for you to grab it, then automatically evacuates water for effortless removal from the pool. 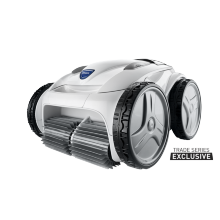 The Polaris P825 Robotic Cleaner deftly navigates all pool surfaces, climbs walls and steps, and scrubs the tile line for thorough cleaning. Proprietary Cyclonic Vacuum Technology ensures powerful cleaning action without losing suction, and the Push'N'Go™ filter canister with transparent viewing window enables easy debris removal without ever touching debris. The P965iQ is a 4WD robotic cleaner that provides premium cleaning performance with the convenience of iAquaLink Control. By connecting to your home’s Wi-Fi network, the P965iQ allows anytime, anywhere access to real-time scheduling programming, and troubleshooting from any smart device using the iAquaLink app.